The Acadian and Francophone Chamber of Commerce (CCAFLIPE) and RDÉE Prince Edward Island proudly proclaim that Saturday, March 16, 2019 will be their “biggest entrepreneurial evening of the year”. Tickets for the entire evening, which takes place at the Centre Belle-Alliance in Summerside, are now on sale for $40 each (tax included). They can be purchased until March 8 at the Wellington Rural Action Centre, the Centre Belle-Alliance in Summerside and the RDÉE PEI office at the Carrefour de l’Isle-Saint-Jean in Charlottetown. 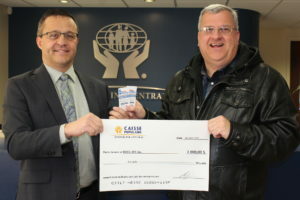 Raymond J. Arsenault, right, Acadian Entrepreneurs’ Gala coordinator, accepts a $1,000 sponsorship cheque from Alfred Arsenault, general manager of Evangeline-Central Credit Union. At the same time, they launched the sale of tickets for the Acadian and Francophone Chamber’s “biggest entrepreneurial evening of the year”, which combines the finals of the 2019 Francophone Ignition Contest and the Gala.